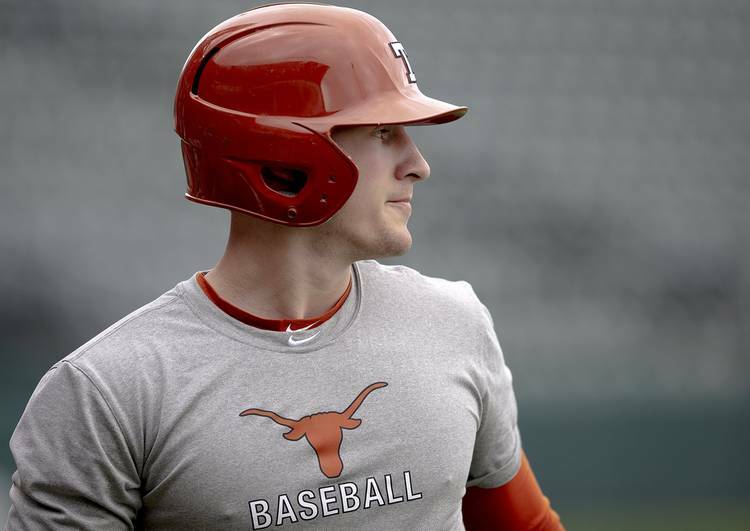 With the start of the 2019 baseball season just three weeks away, 39 Longhorns went through their first practice of the spring on Friday. If all-conference shortstop David Hamilton was healthy, Texas would have had 40 practice participants. Instead, Hamilton was an onlooker at UFCU Disch-Falk Field. Hamilton, who was equipped with crutches and a boot on his right foot, won’t play this season; he recently suffered an Achilles injury in a scooter accident. So, who is the next David Hamilton? At least one of the Longhorns who’s vying to replace him will argue that there isn’t one. Hamilton’s speed — his 31 steals last year were the most for a Longhorn since 2005 — and developing power were assets for Texas. His glove, however, made the biggest impact. Hamilton has been Texas’ shortstop since the first opposing batter of UT’s 2017 season grounded out to the then-freshman. Aside from Hamilton, in fact, only Hibbeler (54 innings over 10 games) and former Longhorn Travis Jones (17 innings over five games) have logged notable playing time at the position over the past two years. Former utility player Jake McKenzie also was rewarded with two one-inning appearances at shortstop last year. Since he arrived at Texas, Hamilton has been responsible for 416 defensive assists, 199 put-outs and only 23 errors. A highlight waiting to happen, he has two of the Big 12’s three 200-assist seasons over the past two years. He also had a hand in 50 of UT’s NCAA-leading 73 double plays in 2018. On Friday, Texas coach David Pierce said that both Hibbeler and freshman Bryce Reagan are competing for reps at shortstop. Both players are also candidates for Kody Clemens’ vacated spot at second base, although either Lance Ford or Bryson Smith could fill that void. Due to his experience, Hibbeler would seem to be the front-runner. He hit .261 with 15 doubles and 30 RBIs last year. Defensively he started at three different spots in the infield before finding a more-permanent home in left field. Pierce said the shortstop position may not be solidified until after the season starts. Whoever wins the job will try to guide Texas back to the College World Series. Texas ended the 2018 season in Omaha, but the loss of Hamilton and the five Longhorns taken in the MLB draft have tampered expectations. UT has been ranked 19th and 21st, respectively, in Baseball America’s and D1Baseball’s preseason polls.